Thursday March 19th 1925 I went to ride with Mrs Porte and got Pullman ticket. Wrote a number of cards before I went. Mrs O'Leary took me down town for much and to a picture show. Wrote Hattie. LeGrand out to dinner with Hepburn Chamberlain. Wrote Major Briggs and Mattie. Pleasant day. Friday March 20th 1925 I was busy in AM in my room. I got my trunk away in afternoon. LeGrand obliged to go out in evening. I went to Station in a taxi. Left Washington at 10.20 PM Saturday March 21st 1925 A very comfortable journey. Ida met me at Newark and we came over in the bus. Visited all evening. I wrote Hattie and went to bed early. 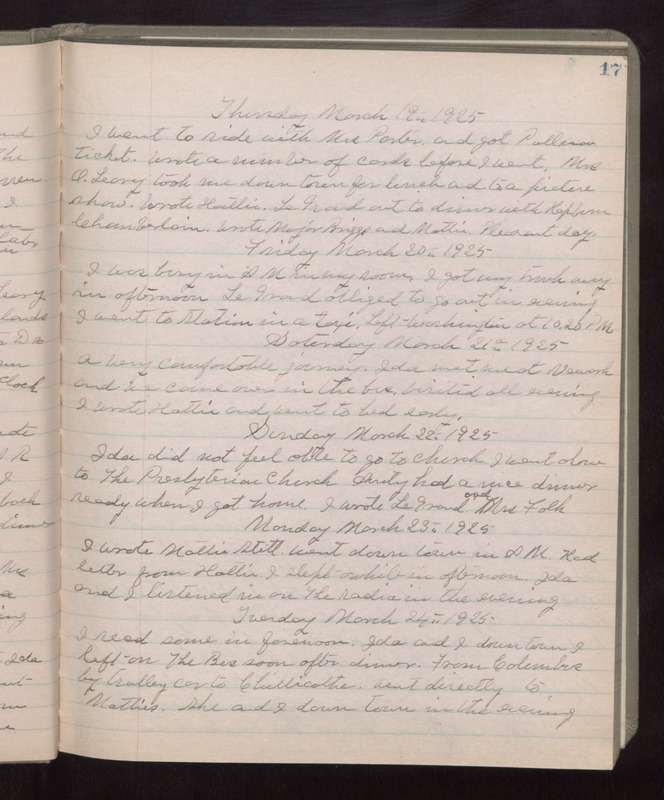 Sunday March 22nd 1925 Ida did not feel able to go to church. I went alone to The Presbyterian Church. Aunty had a nice dinner ready when I got home. I wrote LeGrand and Mrs Falk. Monday March 23rd 1925 I wrote Mattie Stitt. Went down town in AM. Had letter from Hattie. I slept awhile in afternoon. Ida and I listened in on the Radio in the evening. Tuesday March 24th 1925 I read some in forenoon. Ida and I down town. I left on The Bus soon after dinner. From Columbus by trolley car to Chillicothe. Went directly to Matties. She and I down town in the evening.